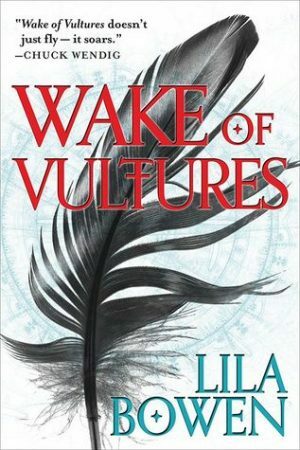 Lila Bowen’s Wake of Vultures is a a wonderful YA fantasy with a truly unforgettable protagonist. It is a fantasy set in the western US. And I am very, very happy I picked up this book. The story opens with Nettie Lonesome, a mixed race girl living with the family that adopted her, but would rather treat her like live-in help than a daughter. After being attacked by a man seemingly immune to scythes but not chunks of stake shaped wood, Nettie can see … things. Things she doesn’t really know how to explain. The world is filled with monsters, some of which really don’t like Nettie very much. Nettie Lonesome protagonist of Wake of Vultures, is the most memorable protagonists in a young adult novel I’ve read since I devoured Tamora Peirce’s novels as a child. The already hard life on ranches and little towns out west is made even more difficult by the supernatural, something Nettie is gifted with seeing. It’s a gritty world, one with foundations in the Old West and western movies with a healthy dose of fantasy and the paranormal, along with Native American folklore. The places are very real; the world jumps off the page. Even better than Lila Bowen’s world building are her characters. Nettie Lonesome is one of the best main character’s I have ever come across. Nettie is a girl of mixed race, raised by a Caucasian family, slowly comes into her Native American heritage, her magical abilities, and the realization that she’s a boy and his name is Rhett Hennessy. Rhett is a strong character, a person who knows exactly who he is and what he has to do even as his entire world shifts around him. Yet, Rhett learns important lessons throughout the book. Slowly, Rhett makes friends. And, even slower, he learns how to trust them. At first, Rhett wants nothing to do with the supernatural. He doesn’t want anything to do with the monsters that keep attacking people close to him, or the strange people who turn into black dust. But, eventually, Rhett stops running and faces fate head on. Wake of Vultures by Lila Bowen is a fast paced, exciting novel that won’t disappoint. The book does end on a cliffhanger, and you’ll want to read the next one right away.